When the Election Act 2017 was drafted, the writers would have had in the back of their minds that Section 73 was there in case of emergencies. “If a contesting candidate dies before commencement of the poll or during the polling hours, the returning officer shall, by public notice, terminate the proceedings relating to that election” reads Section 73. It is a smart clause to have, of course. Anything can happen to anyone at any time. And if a candidate does die before the election, it is imperative to a fair electoral process that there be an open playing field. A party should be allowed to replace their candidate after due consideration. The voters, too, should be given time to make an informed decision in a new scenario. Unfortunately, this election season, Section 73 has been used a little too often. 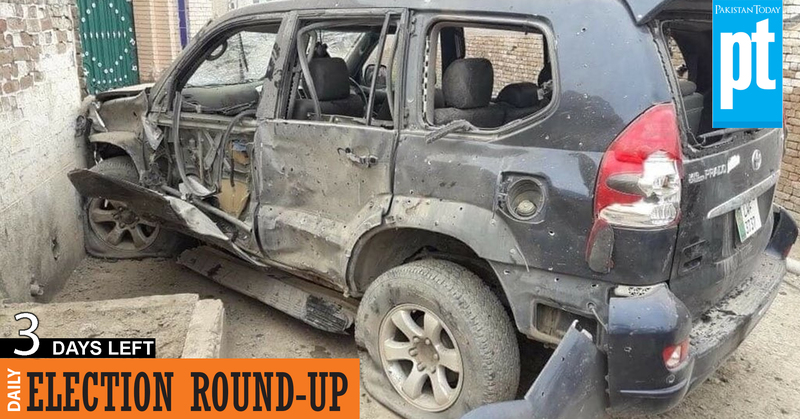 On Sunday, the car of former KP agricultural minister and the PTI’s candidate Akram Khan Durrani in the PK-99 constituency was killed in a suicide blast. He now follows Mir Siraj Raisani, who along with more than 100 people, perished in the deadliest election-related attack in the country. The election in Raisani’s constituency also had to be delayed, just as they were delayed in the constituency of slain ANP leader Haroon Bilour. Even though Section 73 will have been a safety measure for unknowable circumstances, the people that wrote it must also have been acutely aware that it could get more use than they would like given the state of terrorism in the country. Terrorist attack have always had a looming presence in Pakistan, and the danger is at an all-time high with the crowds dense and tensions high because of the elections. As unfortunate as the need to reschedule any elections is, there have been reasons other than terror that called for Section 73. With barely a couple of days left in the polls, elections polls have had to be rescheduled in more places than the three major terror attacks. In Faisalabad, for example, the elections have been delayed because an independent candidate committed suicide after his sons refused to support him politically. As sad as the entire incident is, it is more along the lines of what Section 73 should ideally be there for. Even more ideal is the death in a car crash of a TLP candidate, also in Faisalabad. As terrible as anyone’s unfortunate death is, one would hope for a country where such things are needed because of natural tragedies rather than orchestrated terror attacks. One rescheduling that doesn’t have to do with Section 73 is that of Hanif Abbasi. As the PML-N leader dukes out a life sentence, the ECP has called for a delay since there are only a couple of days to go and the ballot papers have been printed. Meanwhile, one sort of silver lining is that the MMA’s former KP chief minister Asad Durrani has survived a second attack on him in Bannu. Sad sort of positive to be taking away this close to the 25th.